When I turned the car on, a lot of noise (racket) was coming from the area of the glove box. The noise continued for a few minutes and just stopped. I noticed after, that the fan for the heater stopped working. Is it possible for a mouse or small squirrel to have left it's treasure in the fan and ruined it? Or possibly a manufacturing defect. There hasn't been any evidence of mice in the vehicle all winter. First the recall, now this, and car hasn't even had it's first oil change. I'm guessing a rodent infestation. It should be easy to tell. Remove the cabin air filter which is readily accessible behind the glove box. It's possible something got down there and penetrated the filter as there's no intake screen. If the fan is obstructed, I doubt the motor is ruined. The fuse is probably blown. Thanks for the input. The mechanic looked at the air filter and it had been chewed up by rodents. The chewed up pieces got into the fan/motor and burned the motor out. Why in the world is there no screen on the air intake? I'm not a happy Honda owner. My previous vehicle was a Forester, mice got into the cab every year, but never caused significant, only chewed up any paper that was laying around. Thanks for the feedback. Others have had the same issue and questioned the lack of a screen. I'm also surprised there's no thermal overload to protect the fan motor. They are likely getting in by chewing on the tubes or the recirculating air intake. You really need a professional pest control company to bait the foundation of your home and also traps inside your garage. 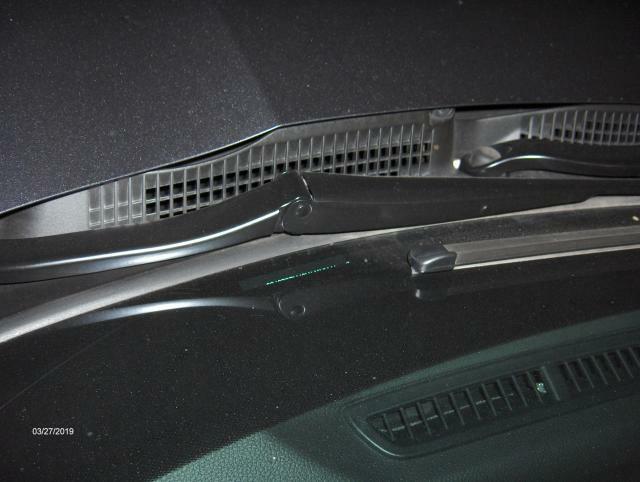 Is this not the HVAC fresh air intake (base of windshield driver's side)????? How does a rodent get thru that? Isn't the recirculate air intake inside the cab, under the dash? Is it? I am not 100% sure but would love to know? The fresh air intake is located on the passenger side directly above the blower. You have to remove the plastic cowling to see the opening. There are large drainage openings on the driver / passenger side fenders that allow water that gets behind the cowling to drain off. That how the mice get in. The reason the grill in the cowling is located on the driver side is to prevent water entering the grill from getting sucked into the actual air intake. One day honda may wise up and put a $0.50 grill over the intake to keep rodents out of the cabin, but I doubt it. I know all my previous jeeps had a grill over the actual intake for that very reason. 2003 Honda CRV - Which fan is the radiator fan and which is the compressor fan?